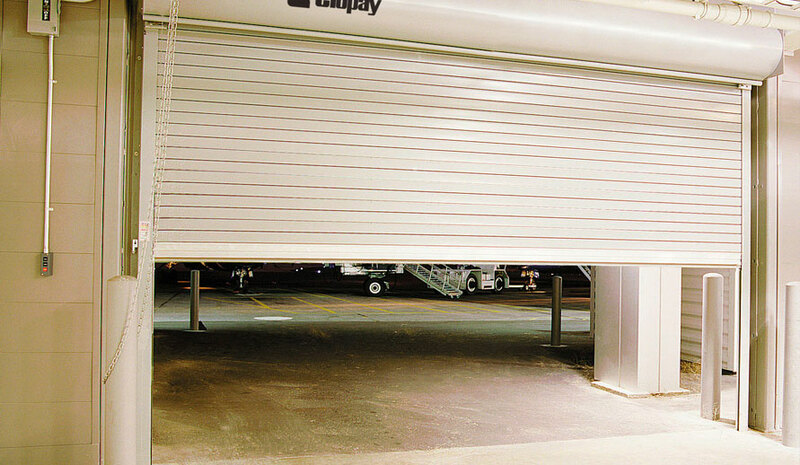 Clopay service doors can accommodate most openings and building requirements. Serving the industry with an array of curtain materials (prefinished galvanized steel in gauges from 24 to 18, stainless, or aluminum), slat profiles, and colors. Wind Load: Doors can be configured to withstand the full range of specific wind load requirements including missile impact ratings. Materials & Finishes: Standard door curtains are available in 24, 22, 20 and 18 gauge galvanized steel in light gray, white or tan. Also 20 gauge 300 series stainless steel with # 4 finish or #16 B&S gauge aluminum with mill, clear or color anodized finish.